I'm an autism mom. Times two. Both of my boys have high functioning autism, and I also have a neurotypical daughter. I believe that autism is a superpower, but that doesn't mean that my boys don't have challenges. Since they are both high functioning, sometimes people don't think they do have autism. Although they are both verbal and appear to be typical at first glance, they do have challenges that affect them in their daily lives. One trait of autism that they both have is having difficulty reading other people's emotions and expressing their own emotions. That's why we love the movie Inside Out so much. When the movie came out on DVD on November 3, I went to Walmart to buy it for my kids, and you should too! Keep reading to see how I'm using the movie to teach my kids how to read and express their emotions. We are huge Disney fans, and we own almost all of their movies on DVD or VHS. When I heard what Inside Out was about, I couldn't wait for it to come out. My younger son doesn't do well in a theater with the loud noises and low lights, so we went to the drive-in to see the movie. This was perfect because he could walk around or lie down on a blanket in the grass while we watched it. My boys both have a hard time reading emotions in other people. Have you ever been so angry that you start smiling, yet your words are harsh? Or smiled through your tears? My boys get very confused because the person is showing two emotions, and they don't know which one to read. They also can not read body language, so they frequently ask me if I am upset or happy because they just can't read the cues that I give. My boys also struggle expressing their own emotions. It's very difficult to tell when either of them are happy because they don't smile, and their voices don't change to reflect their emotion. For the first five years, I thought my younger son could only express anger. He's nine now, and he still doesn't express joy very often. Some people with autism are visual learners. My older son is to some extent, but my younger son tells me that he sees in pictures and movies. When he started reading at age four, he memorized the shape of words instead of sounding them out. He also sees complicated math problems in his head and solves them without converting them to words or even writing them down. It is truly awesome to watch him work out multi-step math problems in his head! 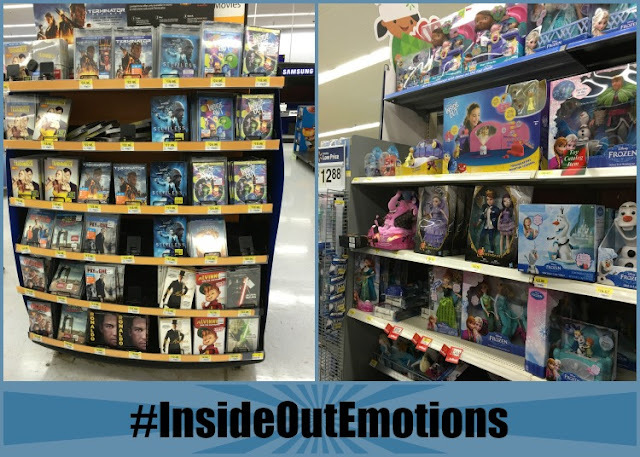 Since he is so visual, having a movie like Inside Out really helps him learn about emotions—both his emotions and other people's emotions. While I was at Walmart buying the DVD, I also picked him up some of the movie characters from Tomy. He likes to play with the characters like he does his action figures, but I found a different way to use them. I created some scenarios that my kids would be familiar with and turned them in to a fun charades game. Playing the game is easy, and even little kids can play. Just print out the scenarios here or create your own. Cut them out, fold them, and place them in a bowl or bag. Each person pulls out one slip of paper and acts it out. Everyone else tries to guess the emotion. This helps my kids learn how to express their own emotions while learning how to read other people's emotions. We also played a variation where we put the memory orbs from each character in the bowl and pulled those out. We had to make up our own scenario that would make us feel that emotion and act it out. This was one a lot harder, but it it was also a lot funnier! Be sure to pick up your copy of Inside Out. I'd love to hear how your family liked the movie!